Hi peeps, how are we doing this lovely Thursday morning? Actually, I'm supposed to be shopping for a new watch for B right now. He is in dire need of a new wrist watch and I've promised him to search for some options online before we actually go to the mall this weekend. Instead of shopping for B however, shopaholic me ended up looking at some gorgeous replica watches for ladies. I used to collect watches but that was a long time ago when I was still single and could splurge on many things without a care in the world. Now that I'm married with responsibilities and three fluffy cats to look after, there are way too many expenses for me to bear. So priorities come first and I don't spend unnecessarily on watches...unless I see one that catches my fancy like this beautiful Gucci watch! When I spotted this lovely time-piece online, it was love at first sight and naturally I got a little side-tracked from my initial intent to shop for B! I already have two Gucci watches so obviously Gucci is one of my favourite brands. Simplicity in design yet elegant is what I look for in my watches and this one here fits the bill perfectly. 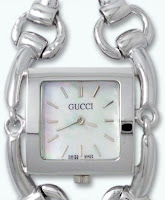 I also prefer silver watches to go with my white gold accessories and I daresay this very pretty Gucci watch would complement my entire appearance beautifully! oh that is lovely GP.. I love silver watches.. mine is also silver in color.. A got it for me as a birthday present in 1999! and I still love it!! Small RM PB this one Mon hohoho! accept.. it says my blog don't qualify.. WTF right? FC LJ and one more point! U and Mon in top 3 so far, syabas! yeah i cannot tweet. there's pop-up box don know what's that! I got only one RM PB to do and one from LW then nothing else…oh no I still haven dropped some more… u finished edi????? I retweet just now via that pop-up box, Marzie and Monica. I had to connect RT to my twitter account. But then I had to copy and paste your post url into the pop-up box because there's no url there. Okok I will start dropping now…for real! I dropped only 62 so far lol! Debbs.. but mine got link .. strange lah this new one after upgrading kan? Just now tweetmeme was upgrading so affect all..
Hmm.. have he not gained weight GP?? That's why lah.. waste my time loggin in only..
You have to allow it Mon.. then it works..
Yahoo.. must topple Mon!! lol! Nite Mon!! Nite GP!! Nite Debbs!! No lah.. no worries.. it's only when pple want to retweet jer..
LOl @ must topple Mon!Sent u email dearie…. Yep.. I hate wasting time also..
Oh LJ went to sleep edi, nite nite dearie, see ya tomo! Eh ur back LJ??? hahahhah tak tidur lagi ke? Wooooo! I will never spend something expensive like that for myself! :p But I might buy one for my dearest wife. Never really tried Gucci brand, owh except Gucci parfume for men. Before Raya, i bought a new wrist watch too. Yeah, i have another watch - you know la those guy's watches with techometer and mini dial up. Best is, it was on discount during Mega Sale. From rm400 - to rm280. But i am sure all those branded ones cost thousands. Cant even afford la Gucci and those designer watch items. I hope you find what you are looking for 4 B. Thanks Rizal, susah nak beli-belah for guys ni…. Time wasting gets on my nerves! For me ho h oho!!! !